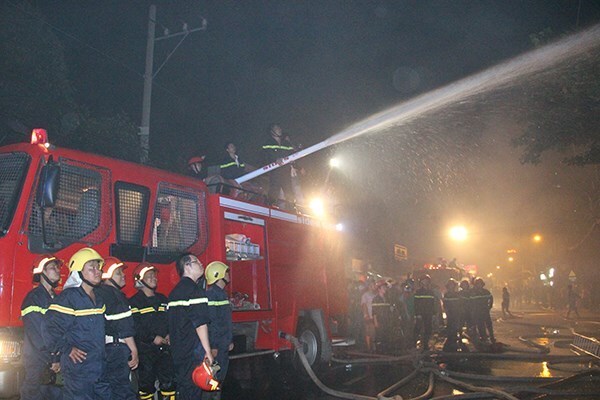 HCM CITY (VNS) — A huge fire broke out at 6.20pm yesterday in a workshop manufacturing mattresses in Tan Phu District, HCM City. Initial reports said the fire flared up in the workshop's store and then spread fast to the neighbouring areas, producing thick smoke. Terrified workers and residents staying near the workshop were quickly evacuated from the area. About 112 firefighters were able to extinguish the fire after two hours. The fire destroyed 700sqm of area, comprising stores and a section of the neighbouring houses. No damage to human life was reported.